No matter how big Kiss has gotten, no many how many years have gone by, one pre-show ritual remains: The putting on of the makeup. Simmons founded Kiss with Paul Stanley in 1973, along with the departed Ace Frehley and Peter Criss. The band wore make up through its ’83 album Lick It Up, though by then Simmons and Stanley had been joined by Bruce Kulick and the late Eric Carr. Kiss donned their famous makeup again in 1996, when Frehley and Criss returned for a reunion. Since, both have left again, replaced by Tommy Thayer and Eric Singer. The new players assumed the personas of their predecessors — Spaceman (Frehley’s character) and Catman (which is Criss’). 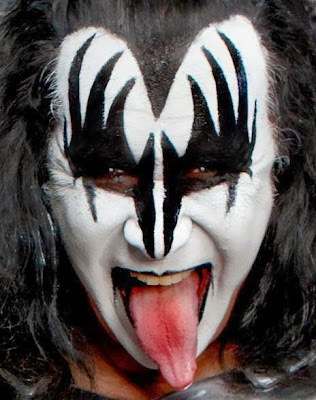 Simmons remains the Demon, while Stanley is the Starchild. The band made up a flood-postponed date in Calgary, Canada, earlier this week. That date concluded the year’s concert appearances in support of Kiss’ latest studio effort Monster, their second with Thayer and Singer. Plans for a UK tour in 2014 have already been confirmed by Simmons.